When the economy does finally take a positive turn, Human Resource professionals agree that turnover will rise significantly as the job market improves. What you do now as an employer is paramount to your short and longer term success when the economy snaps back into shape. You have already taken the first step by acknowledging your understanding of the impact to your organization — happy, productive and dedicated human assets are the key to avoiding turnover and retaining your best talent. Not only is this good for your organization, but to the clients, vendors and providers you deal with on a daily basis. 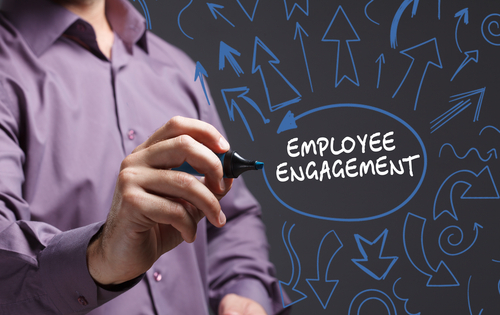 An employee engagement study will yield the results your organization needs. Each organization is different; it is comprised of people with different talents, educational levels, skill sets and goals. No third party or consulting firm can have a tool or can provide generic advice to your company off the shelf. You must proceed using the best information, and an approach that makes sense to your business. Brainstorm with Senior Managers – But you set the tone! Meet with your management or team leaders. Have them buy into the need of truly understanding the workplace and issues that face your human resources on a daily basis. Convey your dedication to effecting change to improve the work place you and so many others are at 40 or more hours each week. Understanding you may meet with some resistance is natural. But your goal to provide a workplace where employees are comfortable, satisfied and see a future at is beneficial to your long term operations, not to mention cheaper than replacing your current human assets; a need you may experience if you act too late. Communicate to your staff that you value their contribution to the success of the organization and that you will be asking for their opinions on how the organization can be improved, made more cost effective, provides better services to the clients and can be a place where everyone can feel comfortable and proud to work. Taking the pulse of your organization, from the ground up is key to understanding workplace issues as voiced by the people that do the job. Evaluate your employee understanding of how they fit into the organization (the role they play), their perception about the company, the direction they feel the company is going, the opportunities that are or will become available, organizational communications and suggestions for improving their job satisfaction. Research will reveal that there are a great number of drivers of employee engagement. And it probably will not be a shock, but depending on the organization, a highly engaged employee could be between 20 and 30% more productive, efficient and valuable to your organization…and likely to stay as his or her needs are being met. After collecting the information, share the results. Thank the employees (and managers) for their candid input and that their suggestions or comments will be addressed with the appropriate people. Do not promise that change will be seen as these issues are frequently not easily transformed into policy. But communicate your desire to be open to these suggestions and issues. Note, if something is found that can be (or must be) implemented that will have a positive impact on your company, find a way to reach out to those employees that provided that data. Express your appreciation and where possible, recognize that/those employee(s) throughout the organization. Several months after the data has been captured, you may wish launch a follow-up campaign comparing your baseline responses already collected, to the perceptions of the staff at that time. Not only will you collect new and meaningful data, but the staff will see that you are interested in following and that you take their suggestions and comments seriously. By the Time It Gets to HR, It’s too Late!